Here in this Saturday bike pic, looking through the summer archive, we captured this biker dude riding across Iowa, with a funky-fury hat. 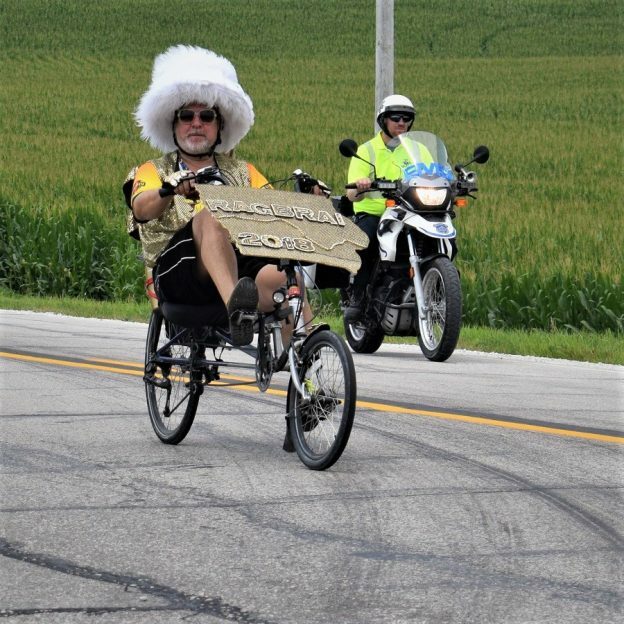 See more fun photo on the RAGBRAI 2018 website. What better way to continue your fun on your #NextBikeAdventure, view all the great ideas and bike destinations in the latest Iowa or Minnesota Bike/Hike Guide. Then plan your next outing with family and friends in one of Minnesota’s HaveFunBiking Destinations. Do you have a fun bicycle related photo of yourself or someone you may know that we should post? If so, please send your picture(s) to editor@HaveFunBiking.com. Include a brief caption (for each) of who is in the photo (if you know) where the picture was shot. Photo should be a minimum of 1,000 pixels wide or larger, to be considered. If we use your photo, you will receive photo credit and acknowledgment on Facebook and Instagram. This entry was posted in Picture of the Day and tagged Across Iowa, bike guide, Bike Iowa, Bike pic, bike touring, family memories, Free maps, Iowa, Monday morning sun, picture perfect, RAGBRAI, ride right, road biking, touring on December 29, 2018 by Russ Lowthian.